SINGLE are products without variations. GROUP are products that hold variants and their common info, they cannot be added to cart. 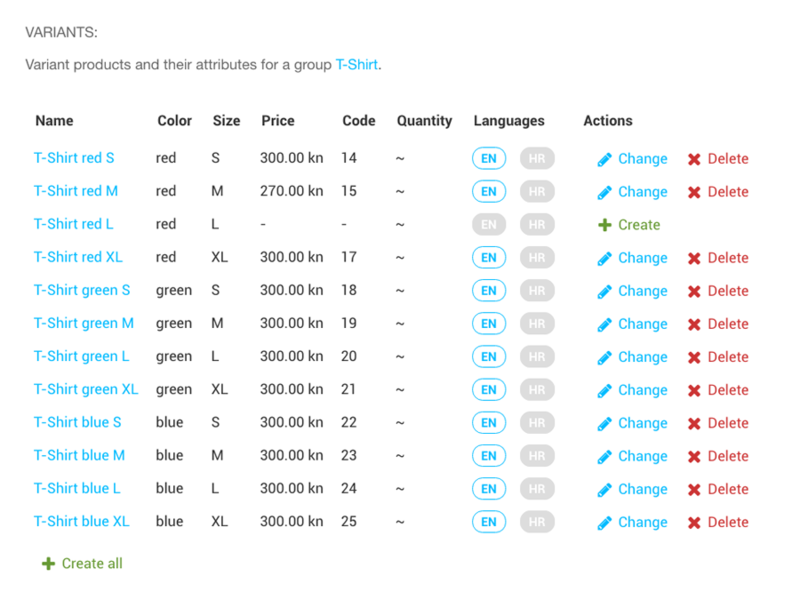 VARIANT are variations of a product that must select a Group, and set their unique attributes. Each of the kinds have their set of rules, and a different validation in admin. A simplest form of a Product. Only requirement is to set the name, slug, code & unit_price. Group products hold common info of their variations and are not considered an actual product that can be added to the cart. They have to specify availible_attributes for the variants to use. Variants of a group that don’t use those attributes will be considered invalid . Variants must specify a group, as well as their unique set of attributes. All attributes specified in availible_attributes of a group, need to be added. Variants are best added through the custom variants field in products admin. Every combination of a variant can be created automatically, and invalid variants deleted as well. Variants can leave most of their fields empty to inherit them from a group. Or choose to override them. Categorization is separated into Category, Brand & Manufacturer models. Tree management is handled by the django-mptt project. Modifiers and in case of category, Tax can be set in categorization to apply to a group of products. Product pricing section consists of a unit_price, discount, tax & summary fields. Discount and tax field are ment for per products use. When different taxes or discounts are required on a product. These values are embeded into a price, when for example you want to have tax included in a price. A summary field shows calculated values in a custom admin field, for convenience. quantity field is used to keep a record of availible units to ship. Leave empty if product is always available, or set to 0 if product is not available. Custom checkbox flags can be added to the Product or to a categorization layer. This allows to easily separate a group of products to display in a different way on site. Measuerments fields are powered by the django-measurement project. width, height, depth, and weight is available. Attribute model lets you design custom attributes with their choices. These attributes are then selected in availible_attributes field on a group product, and used to create product variations. Product model has couple of inline models like Attachment that allows you to add image, video & file attachments to a product. Relation that allows you to add customized relations between products. Review that let’s you manage product customer reviews.